Another in the series of animals to paint is this one featuring cats and kittens. Difficult subjects with all the fur and patterns. However, with the tracings, things are a lot simpler. 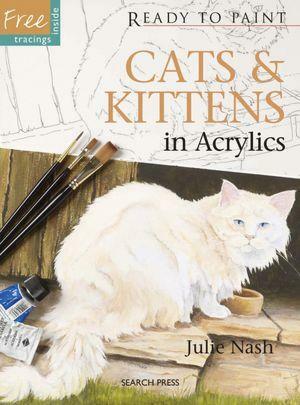 Julie Nash's book covers the Materials you'll need, and each subject has a large number of step-by-step illustrations, showing every detail to help make the most of each picture. Tracings are also supplied. I love the idea of tracings as they can be used over and over, as a learning instrument. Each time you paint the same picture, you'll learn more about the paint as well as your own style. I love the kitty's eyes in tracing 3 as they appear so life-like. I also like the backgrounds of the paintings, any one of which could be used in completely different circumstances and paintings. Conclusion - Easy to follow and infinitely inspirational.